Quick and easy is what this stew is all about. It does not require a four-hour simmer, so it’s perfect for a last minute craving. With preparation time, it took me about 50 minutes to get this on the table. The best part is that it is absolutely delicious. Using pork tenderloin is ideal for this meal since it’s already tender and doesn’t require hours of braising time to make it that way. 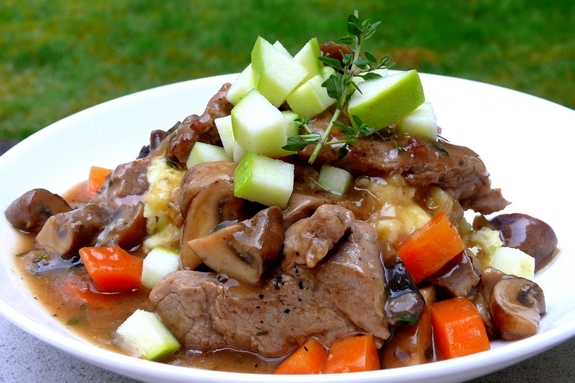 Since the base of the stew uses apple cider, there is a slight sweetness to it. When served over the apple-potato mash, it becomes this over-the-top meal. Don’t leave out the Granny Smith garnish as it reallyadds a nice touch to the dish. With rain today in the Pacific Northwest, this meal is the perfect accompaniment to cold weather. Heat oil and butter in a saute pan or Dutch oven over medium-high heat. Add pork and saute until brown on both sides, about 2 minutes per side. 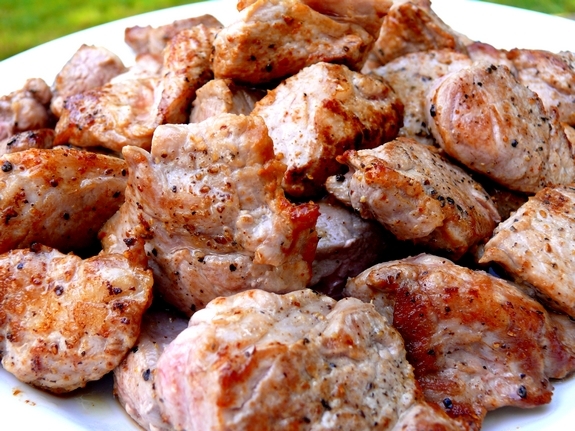 Remove pork to a plate; set aside. 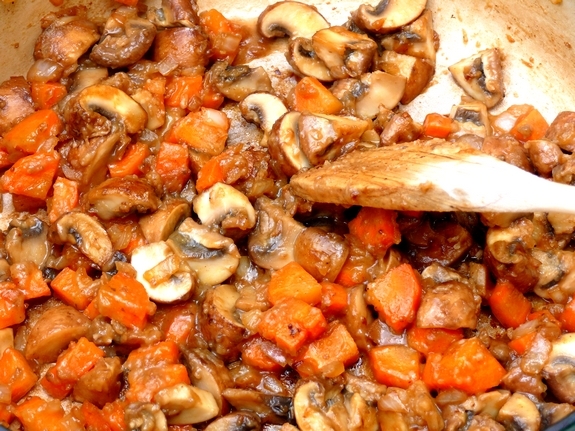 Sweat mushrooms, leeks and carrot in same pan over medium heat until softened, 3-4 minutes. Stir in flour and cook 1 minute. Deglaze the pan with sherry, scraping up any bits on bottom of pan, and reduce until evaporated. Stir in cider and broth; bring to a boil. Reduce heat to medium-low. Add pork with residual juices and 1 Tablespoon thyme. Simmer stew until thickened, 5 minutes. After 5 minutes I still wanted a tad more thickness so I slowly added 1 Tablespoon of cornstarch dissolved in 1 Tablespoon water to the stew. Season with salt and pepper. 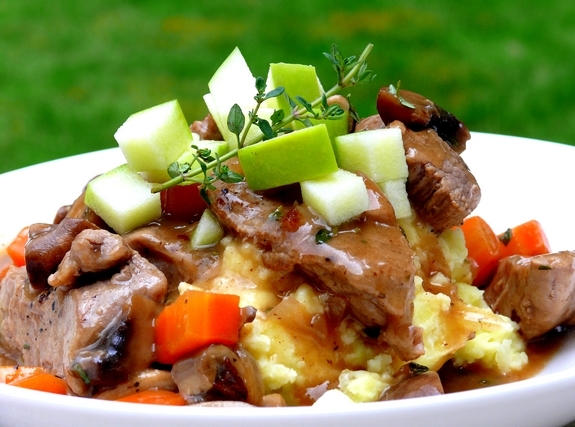 Serve stew over Apple-Potato Mash (recipe below). Garnish each serving with diced apple and a sprig of thyme. Boil potatoes and apple in a pot of salted water until tender, about 15 minutes; drain. Return potatoes to pot over medium heat to dry, 1 minute. Remove pot from heat; add half and half and butter. Mash mixture with a potato masher, then season with salt and white pepper. Perfect to celebrate the arrival of fall!! Love the crunchy apple garnish. Lots of textures in this dish, I love it! Cathy! I made this recipe this week too and will be posting it either tomorrow or on Monday… we loved it. Your photos look excellent as usual. My friends and I have been cooking our way through your delicious recipes, and we were wondering if you have ever considered a cookbook? We’d all buy one!!! This looks so very ‘Fall’ to me! It is being bookmarked for a special dinner! This looks like Autumn has arrived. I can see this on a cool day after a long work out. Every time I eat pork I want applesauce with it so this is perfect. YUM. I love fall, and this looks like the perfect recipe to welcome the season. Can’t wait for it to cool off here so I can make it! Look so silky and delicious! Although we are really enjoying Spring here in South Africa, this looks absolutely SCRUMPTIOUS! Will keep this in mind for a chillier day! Thanx so much! I’m going to bookmark this one. Perfect cool weather food…if we’d ever get any cool weather. Bahh! Yay! I have everything but the pork. Making this tonight, since I’m in the rainy northwest as well. Sounds great! Screams fall … and I’m so ready! Btw, tried your Chili-Lime Tenderloin a couple weeks ago. Two thumbs up! Thanks! Apple potato mash is a brilliant idea! This sounds really great for a cold autumn night! Thanks for posting. Some of my favorite ingredients here. I love pork with cider and sherry with mushrooms and pork with sherry and…well you get the idea. Mashing apples with potatoes. Now that’s new. I’d definitely give it a shot. You’ve got some yummy looking dishes here on these last few posts! Feed me, feed me! Last night’s dinner was cheesy grits with shrimp, my first time to make it, and it was superb! So I know I would love the cheesy polenta. Give me cheese, cheese and more cheese! This dish produced the most mouth watering photos. Excellent job! As soon as I saw this, I knew I had to make it – your dish looks just amazing. Problem 1: I didn’t have the tenderloin, but it’s the weekend, so I had plenty of time to do a low and slow braise with the pork roast I had. Problem 2: No apple juice OR sherry, so I added a chopped apple in with the rest of the vegetables and used sweet vermouth. I don’t know what it would taste like without my substitutions, but this was just delicious. The meat was so tender and flavorful – slightly sweet, but still savory. Perfect. Instead of boiling the apples with the potatoes, I roasted them separately with some whole cloves of garlic, s&p, and a little olive oil, and then folded that into the mashed potatoes. Oh. My. Goodness. Incredible! My boyfriend could only grunt and make delighted moaning sounds between forkfuls. Thanks for the recipe – this was definitely a party in my mouth. Absolutely delicious! A really warm autumn dish. I made this recipe a few weeks ago (and forgot to put in the apples) and today had the lefovers I kept in my freezer. Loved it all over again! For sure a keeper. Thank you! I made this recipe last night and it was wonderful – we will save this. Thank You!! Oh my this looks good! I love quick and easy as long as it doesn’t sacrifice quality. This recipe however looks like it will lead everyone to believe it must have taken you 4 hours to prepare. Thank you. Oh wow, this came out great! I try a lot of different recipes, but a skilled chef I am not. 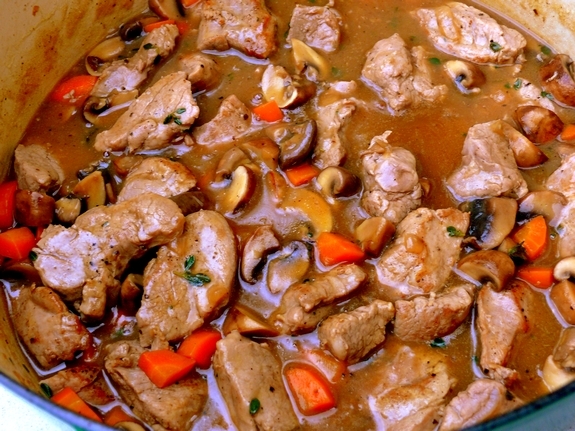 This recipe came up as a result of my search for a new pork dish involving mushrooms. This dish was so well balanced, the stew broth was silky and savory, with just a bit of sweetness. When sweating the leeks, mushrooms and carrots, they released a bit of fluid. Mixing in the flour created a pasty mess and I was concerned. But I cooked it long enough to soak up some liquid as if making a roux, and added the sherry before allowing the flour to get dry, and with a bit of work integrated it all together well. So, did I do something wrong? I agree about thickening the dish further. Thanks for a great recipe, and the beautiful pictures too. Glad to have found your site. Having friends direct from France later this week… guess what’s for dinner? Please, please keep doing what you’re doing. I love it all and so appreciate what goes into this. So glad to hear it!. It’s one of my fave recipes! Looks perfect, I will make it for sure …. but could you explain for those living across the big water – what is “half and half”? It is a mixture of equal parts cream and milk. Question. 2″ chunks of pork seemed too large to cook in 2 minutes a side. The pictures also look like the pork is cut into smaller pieces. The recipe turned out great, but I used 1″ pieces of pork. Also I sweated the carrot/leek mixture too long, and they got too soft by the time cooking cooking was finished.. Next time I will sweat them only until they are barley softened. Great recipe as usual, keep posting them.